Demand for permanent and freelance IT staff is still increasing despite a sizeable drop in IT positions advertised by public sector organisations. According to the latest Salary Services Limited (SSL) research, the number of permanent IT jobs advertised in the third quarter of 2011 increased 1% compared to the previous quarter. There was a 4.7% rise in the number of freelance jobs advertised. The private sector is driving demand as public sector vacancies fell 11.2% in the quarter compared to the previous three months. 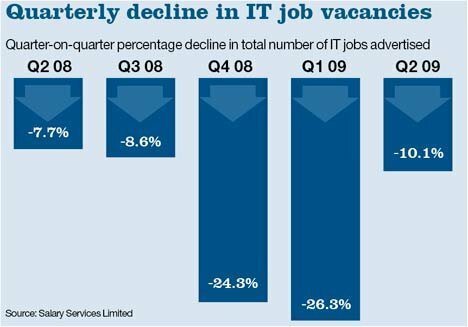 The number of public sector permanent IT jobs advertised in the quarter was 40.6% lower than the same period in 2010. Public sector freelance IT jobs fell 42.2% in the same period. Things look set to get worse in the public sector. The National Audit Office (NAO) recently said it is likely government IT will continue to be subject to heavy spending cuts which will inevitably include job losses. George Molyneux, research director at SSL, said things will get worse in the public sector. "Public sector IT jobs have been steadily declining over the last 18 months and, whilst there were some opportunities for contract staff, they have now disappeared." The survey also revealed the software skills most in demand in the latest quarter of 2011 was SQL. There were 20,046 jobs advertised for SQL. This was 9.7% more than the same period last year. C programmers were the second most in demand, with 15,131 jobs advertised. This was a small increase of 0.6% compared to the number advertised in the third quarter of 2010. The biggest increase in demand was for people with skills in the Agile development methodology. The number of Agile jobs increased by 75% in the third quarter compared to last year, reaching 5,767. Two industry sectors and one region accounted for most permanent IT vacancies in the UK. The number of IT jobs advertised in London and south-east England in the third quarter of 2011 was almost 55,000 . This figure compares with about 25,000 in the rest of the country combined. Inner London saw the number of permanent IT jobs advertised increase 24%, while vacancies in southern England and outer London grew 20.5% and 7.4% respectively. Meanwhile about 59,000 jobs were advertised by software houses and financial services firms, compared to about 10,000 in all other sectors combined. The number of IT jobs advertised in the software sector grew the most at 18.8% while finance IT jobs were the second fastest growing with a 14.3% increase. How many permanent IT jobs are being advertised in different business sectors? How many permanent IT jobs are being advertised in different regions? Has BT made a splash or just restated business as usual? News Analysis: Cloud, mobile, in-memory computing: Has SAP lost the plot?